Orange, CA – R.D. Olson Construction is announcing the renovation of a 10,000 square-foot industrial building, transforming it into the Hilbert Museum of California Art in the historic city of Orange, California. The Irvine, California-based general contractor was selected by Chapman University to construct the new museum which will be located on N. Atchison Street in the heart of Old Towne Orange, adjacent to the University’s campus. The Hilbert Museum will draw from more than 500 California scene paintings from the collection of Mark and Janet Hilbert. The artwork has been featured in several museums throughout California including the Santa Monica California Heritage Museum and the Irvine Museum. The updated space will also incorporate other artistic disciplines, with dance studios, classrooms and offices. The museum complements the cultural development occurring in Old Towne Orange, including the construction of Chapman University’s new Musco Center for the Arts. 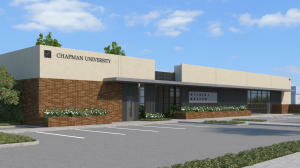 Located in close proximity to industrial, retail, residential and other Chapman University properties, the museum’s exterior will incorporate architectural influences from nearby buildings such as Chapman University’s recent historical adaptive reuse of the California Wire Company Building utilizing brick, exposed beams and corrugated metal. The interior will also have an industrial influence with the use of steel and exposed open ceilings. The existing utility yard will be repurposed to accommodate parking and an outdoor entry area. The Hilbert Museum of California Art is scheduled to open in spring of 2016.